This programme bridges the gap between science and medicine, enabling graduates to understand science in the context of mechanisms of disease and treatment. By fusing science with medicine, our graduates will be ideally placed to translate scientific advances into clinical practice, and to work at a high level within the biomedical sciences. A total of 17 points in three higher level subjects including Biology and Chemistry, with no score below 5. A total of 15 points in three higher level subjects, including Chemistry and Biology, with no score below 5. D3,D3,M1 in three Cambridge Pre-U Principal Subjects. Chemistry and Biology required. A,A,B at Advanced Highers (or A,A at Advanced Higher and B,B,B at Higher), including Chemistry and Biology at Advanced Higher. Successful completion of the WBQ Advanced Skills Challenge Certificate plus 2 GCE A-Levels at grades AAB. Chemistry and Biology required. You will gain a solid foundation in medicine and biomedical sciences through exposure to a variety of different disciplines together with laboratory skills. You will attain the skills required to achieve high-level employment in biomedical research, in the pharmaceutical industry, in biotechnology, clinical trials, hospital management, public health, and nutrition, along with other fields. You will have the benefit of sessions specifically designed to enhance creativity and inventiveness and to develop team work. The programme will give you access to inspirational talks by external speakers on science, medicine and the arts. You will be taught by clinicians as well as basic scientists. This fusion of science and medicine will give graduates a competitive advantage in careers at the interface of these two disciplines. Year one is demanding, covering the foundations of human biology and medicine. The core modules provide an understanding of how the body works, what goes wrong in disease and how to treat it. You will be mostly based at UCL’s Royal Free campus in Hampstead, North London, and taught by world-leading scientists and clinicians. The programme is designed not just around individual excellence, but also around all-important team skills. As an example, you will be enrolled into one of four 'houses' which compete for points in various events, both fun and academic, including invention activities. In year two, you will take five compulsory modules. There are a wide range of optional modules, of which you will select three. This flexibility will enable you to choose your own route within the biomedical sciences: between biomedical entrepreneurship, clinical trials, the study of infection, or regenerative medicine and nanotechnology. Year three follows a similar pattern, with modules built around a solid applied medical science core. You can tailor a programme to suit your needs and aspirations, while the core skills will give you the grounding to pursue a career you enjoy. You will also have the option of undertaking a self-organised one-month professional placement and will be engaged on a six month research project. All modules are worth 0.5 units. One of the three optional modules may be from another UCL department, as appropriate. One of the five optional modules may be from another UCL department, as appropriate. Our innovative online teaching system allows you to learn at your own pace and explore topics in greater depth. The face-to-face teaching which follows offers more intensive, creative sessions of problem solving and learning in small groups. Practicals and a research project support your training in laboratory skills. Combining online and face-to-face teaching means you take greater control of your academic development. Formative and summative assessment methods include: online and written examinations (some of which are multiple-choice or short-answer question format); coursework; poster presentations; practical skills assessments. In year three you will be required to write a project dissertation and, should you choose the professional experience module, a reflective diary on your placement. Detailed course descriptions are available on the department website: Applied Medical Sciences BSc. 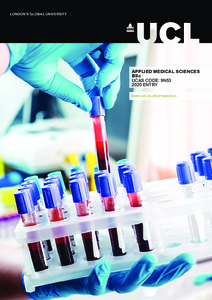 Applied Medical Sciences differs from most biomedical science degrees in that students develop a very strong understanding of the foundations of medicine, with an emphasis on fusing science with medicine. The programme is angled towards the development of an appreciation of how science helps us to understand and treat various diseases. This programme will enable you to become a highly skilled scientist who can make medicine work for patients. Alternatively, you might like to use your knowledge to find a career in research. You will also be able to adapt your skills to a variety of other professions where an understanding of science and medicine are crucial. We expect all our graduates to be capable of working in any of the biomedical sciences that they choose to pursue. We envisage that our graduates will play key roles in clinical trials, biomedical research, nanotechnology, drug design, the pharmaceutical industry, the regenerative repair industry and postgraduate research. If you are concerned by potential additional costs for books, equipment, etc. on this programme, please get in touch with the relevant departmental contact (details given on this page). For students who undertake the professional experience module, additional costs may include travel and accommodation. Evidence in your application of a sustained interest in science, demonstrating your self-motivation and organisational skills, is important. This programme will suit students who want to make a difference in the world, who are innovative and inventive, ready to take an active role in their learning, prepared to be challenged, and willing to explore areas outside their comfort zones. We will use your predicted or achieved academic qualifications, your personal statement and your reference to decide whether to offer you a place.